Yesterday Josh Hamilton tied an MLB record with 15 other players, hitting four home runs in one game. 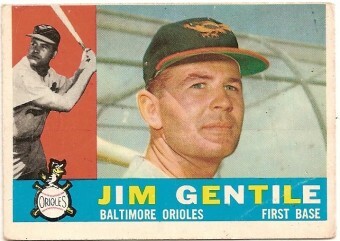 Something even more rare happened on this day in history, Baltimore Orioles first basemen, ‘Diamond’ Jim Gentile, managed to hit a grand slam in two consecutive innings (the 1st and the 2nd inning, both home runs estimated at 410 ft), becoming the first player in history to manage this feat, on his way to a monster year. In that year, Gentile’s second full season in the big leagues, he hit .302 with a .423 on base percentage, mashed 46 home runs and drove in 141 runs, by far the best season of his career, though he was a solid all-around player for the majority of his career. That 1961 seasons he also managed 5 total grand slams, a record that would stand for 26 years until Don Mattingly would hit 6 in 1987, oddly the only grand slams Mattingly hit his entire illustrious career. These MVP caliber numbers for Gentile ended up not being good enough for the award that year; Gentile finished third. Why? Well, if you know your baseball history, that was the year Roger Maris and Mickey Mantle chased the Babe’s single season home run record, with Maris ultimately passing it, hitting 61 home runs. Mantle fell short with 54 home runs. Maris ended up winning the MVP, though in truth Mantle arguably had the best year of the three, hitting .317 with a .448 on base percentage and worth 11.1 WAR (wins above replacement), compared to Gentile’s 8.6 WAR and Maris’ 7.9 WAR. However, you break one of the most important records in baseball, held by a legend and once thought an unbreakable record, and that gives you a bit of a boost in the MVP voting I suppose. Since Gentile’s two consecutive slams, five other players besides himself have hit grand slams in back to back innings: Jim Northrup (1968), Frank Robinson (1970), Robin Ventura (1995), Bill Mueller (2003), and Josh Willingham (2009). However, one player did something a little bit more impressive and rare when it comes to grand slams, Fernando Tatis on April 23, 1999 managed two grand slams in the same inning, both off of Chan Ho Park. It should also be noted that you’ll sometimes read that Jim Tabor in 1939 managed grand slams in back to back innings, becoming the ‘real’ first to do this, but in fact he did not *looks at Wikipedia disapprovingly*. While he did hit two grand slams in the second game of the doubleheader on July 4, 1939, he did not do so in back to back innings, rather in the 3rd and 6th innings. In addition to those two slams, he hit a solo shot in that game. Further, in the first game that day, he also hit a home run, giving him a total of 6 hits with 4 home runs, 1 double, and 1 walk on the day. Talk about being in the zone. The Red Sox scored a total of 35 runs that day vs. the Athletics’ 19. Not a good day for the pitchers apparently. Another amazing thing happened yesterday in baseball, besides Hamilton’s four home run game, that has only happened once before, namely that Adam Dunn struck out in the 9th inning, extending his consecutive games with a strikeout to 35, something that only one other player has done before. Today, Dunn struck-out again, extending the streak to 36. One more and the record will be all his! Mike Cameron of the Seattle Mariners just missed becoming the first MLB player to hit five home runs in a game. On that fateful day, May 2, 2002, against the White Sox where he hit four home runs, in his final at bat in the ninth inning he flew out to the edge of the warning track in right center field, where the center fielder leaped and caught the ball up against the wall. Just a couple more feet and that would have made five in one game. Cameron had six total at bats that game, hitting home runs in his first four at bats, all by the fifth inning. In his fifth at bat, he was hit by a pitch, then in his sixth flew out as described. While he didn’t manage to set the single game home run record all by himself, Cameron did help establish another singular record which has never been done before that day. In the first inning, Bret Boone hit two home runs and Mike Cameron, batting right behind him, hit two. This is the only time in Major League history that two players on the same team have each hit two home runs in the same inning. Something that is also interesting about that Mariners/White Sox game on May 2, 2002 was that despite the Mariners having runners all over the place (ultimately tallying 15 runs from 16 hits and 4 walks), all four of Cameron’s home runs were solo shots. The first MLB player to hit four home runs in a game was Bobby Lowe on May 30, 1894. The first Major Leaguer to hit a grand slam is thought to be Roger Connor on September 10, 1881, playing for the Troy Trojans. However, it should be noted that it is known that another player, Charlie Gould, playing for the Boston Red Stockings which was part of the National Association, hit a grand slam in 1871. However, even though the Boston Red Stockings ultimately became the Atlanta Braves, a Major League club, because it was at the time a member of the National Association it doesn’t officially count, as Major League Baseball doesn’t recognize stats from the National Association. All total, 13 players in the history of the game have managed two grand slams in the same game. The first was Tony Lazzeri on May 24, 1936 and the last (to date) was Josh Willingham on July 27, 2009. The most grand slams hit over the course of a career by any player is currently 23, accomplished by Lou Gehrig. However, Alex Rodriguez is nipping at his heals with 22. Manny Ramirez is also fairly close with 21. When Travis Hafner tied Mattingly’s six grand slams in a single season record in 2006, he hit five of them before the All-Star break, hitting only one in the second half of the season. King Félix Hernández not only is a ridiculously talented pitcher, but also managed to become the first American League pitcher to hit a grand slam since 1973, the year the DH rule was instituted. He did this off of none other than Johan Santana… with his eyes closed (seriously). At the time the ball got to the plate, Felix’s eyes were closed as he swung as hard as he could. That game wasn’t all sunshine lollipops for Hernandez though, he injured his ankle trying to block home plate like a catcher as a runner came bearing down on him. Another rare pitcher record was accomplished by Johnny Vander Meer in 1938 when he managed back to back no hitters. While there are about two no hitters per season on average, no one has yet managed to match that, though Justin Verlander has most recently come closest. The next game after Verlander’s second no-hitter in 2011, he managed to get into the sixth inning before giving up a hit. On September 2, 2008, the hapless Seattle Mariners managed to cause their fans (including me) to facepalm once again when they managed to become what I *think* is the only team to ever get a triple play turned against them without the bat ever touching the ball. In that game, Raul Ibanez struckout. While he was doing this, Adrian Beltre attempted to steal second and was thrown out. Jose Lopez then tried to steal home when he saw the throw going into second, but he too was thrown out. That’s basically Mariners’ fandom in a nutshell over the last 8-ish season. But things are finally looking up… at least… until the “Oh right, Mariners” kicks in, I suppose. Toby Harrah, playing for the Texas Rangers, managed to set a new obscure record in two consecutive seasons. In 1976, he played shortstop in both games of a double header. This is not the record obviously, the record is the fact that not one ball was hit to him in either game, becoming the first time a shortstop has played every inning of a double header and never had the ball hit to him. The following year, Harrah and Bump Wills hit back to back inside the park home runs, the only time that’s ever happened to date. No … He had six “Plate Appearances” in the game, but he had only five “At Bats.” When a batter is hit by a pitch, no “at bat” is charged, but a “plate appearance” is counted. Thanks for all the interesting trivia in the article!